Arrival at International Space Station. 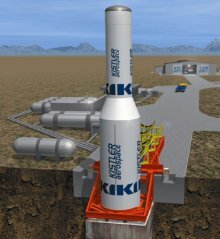 The K-1 was intended to be a two-stage, fully reusable aerospace vehicle designed to carry out a wide range of missions, including payload delivery to low-earth orbit (LEO), payload delivery to high-energy orbits with a K-1 Active Dispenser, technology demonstration flights, microgravity missions, and commercial cargo resupply, recovery, and reboost services for the International Space Station. 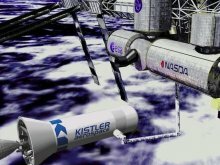 It was being developed by Rocketplane Kistler, a company which won an award from NASA of more than $200 million to help with work on the K-1, especially as it related to the ISS. 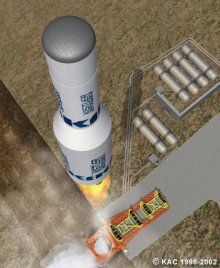 The K-1 would have been 121 feet (36.9 meters) in overall length, 22 feet (6.7 meters) in diameter and weigh 841,000 pounds (382,300 kilograms) at liftoff. The vehicle, powered by liquid-propellant engines supplied by Aerojet Corporation, was designed to be reused 100 times. 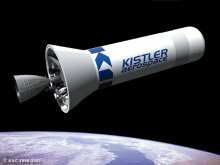 Rocketplane Kistler planned to establish two launch sites for operating the K-1, at Woomera, Australia, and Spaceport Nevada. Test flights and initial commercial operations would have been conducted from Woomera. Spaceport Nevada was to have been the second launch site and is located at the Nevada Test Site, near Las Vegas. engines Three Aerojet AJ26-58/-59 LOX/kerosene engines with a total sea-level thrust of 1,020,000 lbf (4,540 kN) One Aerojet AJ26-60 LOX/kerosene engine with a total vacuum thrust of 395,000 lbf (1,760 kN).